We hope you will find inside this site some wonderful early C.F. Martins, Gibsons and other interesting guitars from the golden era. We are always actively seeking and buying pre-1965 Martins and Gibsons. Please feel free to contact us directly if you have an early guitar to sell or consign. Below you will find our usual blurb..........hope to see you along the trail. ARRIVED: We have had the immense good fortune to be able to acquire THE 1948 Martin D-28 that was owned in the early 60's by Jackson C. Frank.......the very one that he used to write and record his only album and is pictured on his only album cover. It's been obscure since 1966 and is only now making daylight. I'm still taking it in mentally and hope it might find it's way into a few current productions and documentaries about Jackson that are under way. What an important guitar relative to the emerging folk scene in Britain at that time and to the very short lived and tramatic career of Jackson C. Frank. We've some good things in store and a few rarities have turned our way in the last few months. For those of you looking to sell an American vintage acoustic(s), we are always actively looking for pre-1965 C.F. Martins and Gibsons and will reply promptly to any inquiries. We offer free shipping to all mainland U.K. destinations on sales and will arrange and pay for the pick up of any guitars you are looking to sell. Contact me (Tony) at info@replayacoustics.co.uk for details about how to go about selling or consigning your instrument. I just spent a packet on upgrading the website so that it is phone compatable....... you can now get the site on your handhelds and pads........we've also upgraded the technicals so the pictures are crisper and clearer and the site works faster than it did. A new type style and some trimming here and there of excess copy and I hope you like it. To quote the book: "Gibson's Fabulous Flattop Guitars", "C.F. Martin's are the Mercedes of the guitar world !" From build quality and sound refinement to tonewoods, innovation and industry leadership, Martins are the finest and most consistent mass produced guitars in the world. Beautiful quality and exceptional tone dominate the brand. And the Gibson's ??? "Gibson's are the Fords and the Chevys !" Being an American, I know what that means...the heart and the soul....the workingmans music and some of the warmest, most tactile guitars on the planet. Vintage Gibson guitars are....well, how do I put it?.......like a favoured pair of old jeans or cowboy boots !! Thuddy, quirky, soft and incredibly beautiful with their painted sunset tones on old spruce planks !! By no means second best.....just different in a very vintage acoustic sort of way !! So our concept behind Replay Acoustics, which is a web based business located near Sevenoaks in Kent, is to be a consistent and prominent source of good quality vintage Martin and Gibson guitars. We carry the largest selection of vintage Gibson and Martin acoustic guitars in the country. Since acoustic guitars are constructed of wood, a moving, breathing organic material, they have a character and a feel that is unique to each instrument. The wood breathes throughout it's existence, influencing tonal quality, sustain, projection and condition. Although Replay Acoustics handles predominately vintage Gibson and Martin guitars with little or no restoration, a deep understanding of woods and their properties creates a level of appreciation for and understanding of the typical problems associated with acoustic instruments as well as the sometime need for impeccable restoration particularly in rare or fabulous sounding instruments. We prefer instruments that have been played a lot.....they have character and have matured and opened up over time, taking on a richer, mellower tone. After all, it is all about sound and playability for the player of good vintage acoustic guitars and Replay Acoustics strives to provide just that. Instruments with great tone and excellent playability. If needed, we recommend restoration and repair services thru Dave King, approved warranty luthier for Martin Guitars, Graham Parker, Andy Crockett or David Crozier.... equally adept at the dark arts. We will expedite repairs on your own guitars as a matter of courtesy and free service and/or put you in touch with them. We will take no fee for this. We are always interested in purchasing vintage acoustic and archtop guitars by Martin and Gibson as well as taking consignments for luthier built instruments like Santa Cruz, Froggy Bottom, Collings, etc, so if you have something to sell or you are thinning out the herd, please send us an email and we will reply as quickly as possible. But at the end of the day, Replay Acoustics is about bringing together quality vintage guitars and guitar players of all levels. We hope you will find our collection interesting and above average. And remember: If you don't know where you're goin, any road will get you there !! The alternative in Rare and Vintage Acoustic Guitars !! At Replay Acoustics we are proud to be associated with people as passionate about their art as we are. 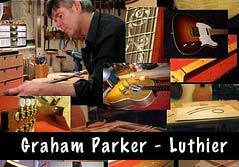 Finding a skilled luthier can be a tough job so we are delighted to promote Graham Parker, a highly respected luthier and long time member of the Institute of Musical Instrument Technology. To view his website click here.